Barbara Geshekter is a talented writer and consultant who lives in the Chico area. Barbara needed a credible brand for her new book. Knowing she would need a few basics (Logo, business card, dust jacket and website) - we got right to work. We immediately paired her with a fantastic photographer to help capture Barbara's personality and then created a brand and look that would inspire people to purchase her book around those pictures. We utilized her own signature as her logo - which was fitting for an author. 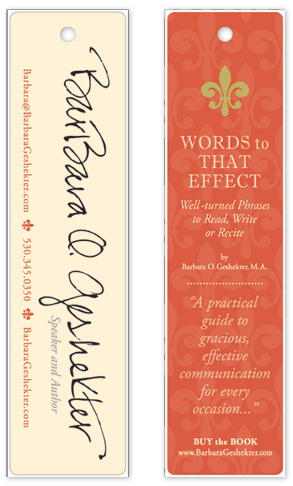 She was on a budget, so we suggested that we create a "bookmark" for her business card - doubling as a dual marketing piece. It was a big hit! The book is currently in circulation and is available on her website.